Crocodiles are commonly found in the zoo, but on the 13th, a reporter unexpectedly saw one in Guangdong Zhongshan's huge supermarket. The decapitated crocodile lay still and motionless on a pile of ice, waiting to be sold as it's the first time that crocodile meat is part of the diet for the people of Zhongshan. What about it's price? This "delicacy" costs 198 Yuan per 500 grams, but its paws are slightly more expensive as they are sold for 300 Yuan each. 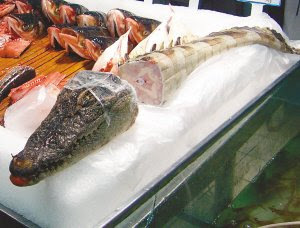 A staff of the supermarket explained though many shoppers were just curious, sometimes the crocodile meat were selling fast and could fetch few thousand Yuan. 54 animals were being approved for breeding for consumer purposes by the government, and believe it or not, the crocodile is one of them.